It's a wonderful place to visit in the winter if for nothing else, the novelty. The Hot Springs are usually pretty packed during the winter with mostly Japanese tourists who come up for an adventure. Congratulations? Looks nice to me. I admit I love snow, I just don't want it to stay around so damn long. Winter without snow and hardships? Too odd. It really does look pretty. It is actually not bad at all and once it starts snowing for real, then you don't get wet anymore. I'm not sure if I'm looking forward to the snow though I really don't care for the transition time. Time to pump up the tires on my mountain bike and make use of it's studded tires. You have studded bike tires? Good for you! Years ago I rode on snow, ice and slush with nothing more than my regular knobby tires, but now I think I would get some studded ones. Did you make your own? No, I got them at REI and are made by Nokian from Finland. If I remember correctly, there was a choice of multiple tires with different density of studs. Depended on the terrain you were planning to ride on. I am oddly attracted by your last picture. 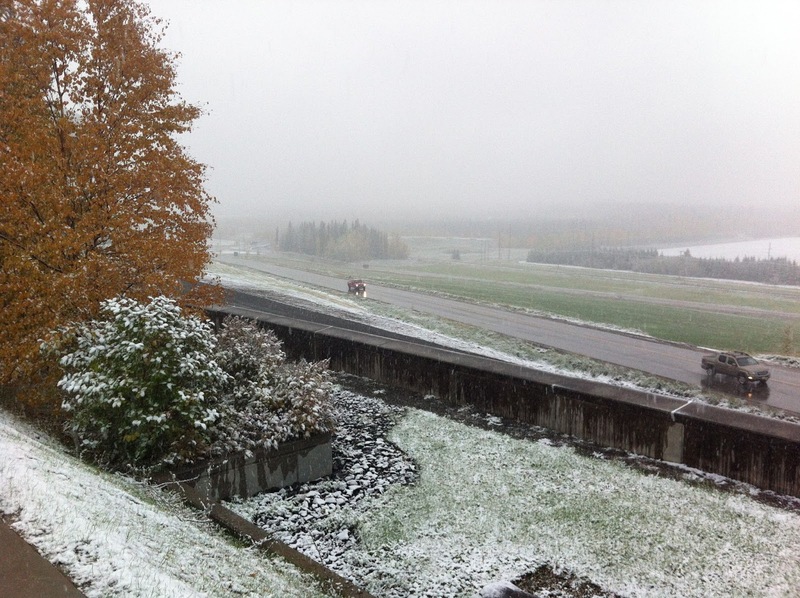 I remember we had snow in September in Calgary, but usually it didn't last long. Looks like high time for tire change. I'm thinking that I just may be able to get the same studs that I used last year into the outer blocks of the front tires. And they should still bite when turning. The new Heidenau K60 rear tire is sitting in the garage right now ready to put on. I have 4 snows mounted on separate rims which I change over during Thanksgiving. We keep our fingers & Toes crossed that we don't need them. Most years we seldom get snow which lasts more than a couple of weeks. You just never know . . .
Due to the federally mandated tire pressure sensors, if you change wheels, you need to visit a dealer so they can recode the new sensors. I'm told that they charge ~$100 just to do that. For now, it's easier to swap tires. I hear that there is an aftermarket TPS that you can clone the ID of the original sensors. Then you could swap wheels without a visit to the dealer. 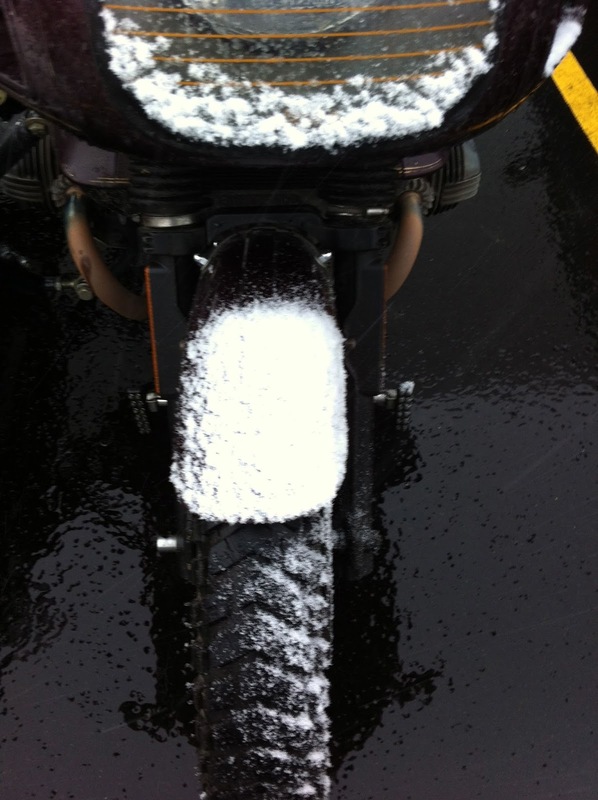 We usually leave the studded tires on until mid-May. By then the ice on our driveway is usually gone. never thought of that. I only have TPS on my Beemer and 'Vette but I only use those in the summer so no snow tires. My Honda does not have TPS. I used to use studded tires but they are not suited for our roads down here, where we mostly have bare pavement. They don't work as well as Ice rated dedicated snow tires, as studs "slip and slide"
There are a kit of unplowed or marginally maintained roads around here (including our driveway) so the studded tires make sense. If you live in town or on mostly flat areas, then the ice rated tires seem to work pretty well and in many cases better. There have been more than a few times when chains were still required to get around due to ice on the roads. Lucky! I wish we would get early snows here....then again, maybe not to give the folks affected by the floods time to recover somewhat. They refer to the light, first snowfall as termination dust and truly the end of the summer. And a not too subtle reminder that you need to start getting ready for winter. I'm hoping I'm a good 5 weeks behind you for snow.... Even better if we didn't see any until mid November! I got snowed on last week, a drizzle of dandruff really, and I think it is vastly overrated. Even the Permanent Fund fails to overcome my revulsion. No snow here yet, but I do recall there a snowstorm here in September once when I was a kid. SNow that really sticks is very unusual. The first "real" snow usually isn't 'til next month. 5 weeks doesn't seem like you're asking for much though you are in a really cold area. Much colder than here due to the wind. Wow, that seems a little early. Was it forecast or a surprise? I remember driving through a freak snowstorm in Banff in August back in the early 90's. That was a surprise. It was forecast but it was really early. The earliest date for snow tires is September 15th. Snow in the hills in September isn't unusual at all. I drove through a snowstorm in northern B.C. in the middle of August before. That was a surprise. I didn't expect that at all and was planning on camping all the way back to Alaska. But it was gone by the time we got to Whitehorse so it was just in the mountains as you go through the Rockies. I tried it and didn't care for the additional rules and requirements. One of which is having to use your full name everywhere. I visit Google+ maybe once a month as I find the short form posts more common there to be less interesting. But we already know your name and you can still abbreviate to Richard M.
Yes, post there are shorter but all you have to do is put the link to the blog. That's what I do. I have a circle of bloggers and all I have to do is select that circle and can quickly see who has new posts. Google Reader is now gone and some of the other readers out there just aren't as easy to use. Okay, I'll try it again. It took a lot of poking around to change my display name. They make it way harder than it should be. You should do a post explains the how and why.